Don’t let your brakes reach breaking point – read our advice on the most common problems we come across and how to avoid letting them affect your journeys. In addition to being one of the major causes of public service vehicle (PSV) prohibitions, braking defects are the number one cause of heavy goods vehicle (HGV) and trailer prohibitions in the UK. They make up 10% of all HGV and 20% of trailer prohibitions issued. It goes without saying that a well-maintained braking system is essential to operate a safe vehicle. Good operator maintenance systems and driver first-use checks should spot and deal with defects before they reach the point where we have to issue a prohibition. Brake disc fractures are the biggest problem on HGVs, totalling 19% of the brake prohibitions and 9% of trailer prohibitions. As a general guide, we will issue a prohibition if a brake disc fracture extends through the disc surface to the ventilation cavity. 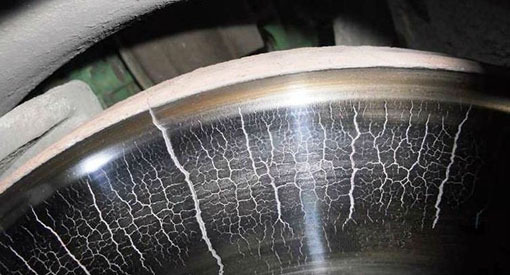 You should closely monitor the condition of heat cracks on the surface of brake discs, as they can quickly deteriorate. If there are cracks running from the edge of the brake disc to the centre, the disc must be replaced. You should consult the manufacturer’s guidance on brake disc wear tolerances, when deciding whether a brake disc is serviceable. Another common defect is excessive brake actuator travel, which is normally associated with poor maintenance of automatic slack adjusters (ASAs). All HGVs, trailers and PSVs over 3.5T from 1995 are fitted with ASAs that must work correctly. If they need regular manual adjustment, they are not working correctly. ASAs are subject to wear, so you will need to assess them regularly and replace them as necessary. Read the VOSA guide to maintaining automatic slack adjusters. The driver should be the first person in your preventative maintenance system to identify potential braking faults, normally by a warning light or noise when the brakes are applied. Therefore, operators should ensure that drivers are aware of defective brake symptoms, and that they know how to identify and report problems. Drivers should be familiar with the warning lights on their vehicle – there are many variations to warning lights and their sequences. If a warning light indicates a potential fault, the driver should make sure the vehicle is safe to drive, or risk a prohibition and the Operator Compliance Risk Score (OCRS) points that go with it. Air leaks on the braking system are another common defect that drivers should notice during the first-use check or as they apply the brakes. If the driver hears an air leak when pressing the foot brake, there could be a serious problem – get it checked out! Well managed vehicle and trailer maintenance will support safer roads and help operators to avoid the repercussions of a poor OCRS. If the driver is in any doubt whether to use the vehicle, they should check with the Transport Manager or the person responsible for vehicle maintenance before they begin their journey.